Tiger Woods plays an approach Thursday at Augusta. Tiger Woods returned to the Masters on Thursday for the first time since 2015, shooting an opening-round 1-over 73 and slotting into 29th place headed into Friday. One year after his fourth back surgery — and six months removed from talk that he might never play competitive golf again — the 42-year-old is in the midst of a highly anticipated comeback. So far, Woods has delivered. He finished in the top five at back-to-back PGA Tour events in March, and television ratings, ticket prices and fan excitement have swelled with his return. And that got me wondering — just how much of an impact does Woods have on television ratings for the Masters? Considering that the likes of Jordan Spieth (first place through round one) and Rory McIlroy (tied for fourth) remain in contention as we near the weekend, are they a decent enough consolation prize for CBS if Woods falls off pace by Sunday? Tiger Woods’s first two Masters victories, in 1997 (14.1 Sunday rating) and 2001 (13.3), produced the highest Sunday ratings in event history — about 50 percent above the long-term average. In ratings terms, that’s roughly on par with last year’s college football national championship and the deciding game of the NBA Finals. In 1997, Woods became the youngest champion at the Masters, set a new margin-of-victory record and shot the tournament’s lowest-ever 72-hole score.4 Ratings came back to earth when he won again in 2002 (9.2) and 2005 (9.8) but were still above average. The next three highest-rated rounds came in 1975 (11.9), 1972 (11.8) and 1966 (10.9),5 when Jack Nicklaus won three of his six green jackets. And that matters. From a ratings perspective, viewers don’t seem to care very much who’s battling it out atop the leaderboard on the final day of the Masters — unless it’s Tiger Woods or Jack Nicklaus. In the table below, you can see how television ratings increase with the success of those two. Statistics bear this out, too. High finishes by Woods and Nicklaus are the only variables I identified that have a statistically significant effect on Sunday ratings. There’s no bounce when most other big names do well — and in many cases, there’s a decline. And what about when lesser-known golfers take home the green jacket — like if Tony Finau or Bernd Wiesberger were to make a run on Sunday after solid starts? In those cases, CBS should hope they’re dueling with Tiger Woods. When Adam Scott, Charl Schwartzel and Trevor Immelman won in 2013, 2011 and 2008, respectively, Tiger finished in the top five. Those Sundays saw an average rating of 9.2. Meanwhile, Danny Willett and Mike Weir’s victories — with Woods out of the tournament in 2016 and out of the top 10 in 2003 — produced an average final-round rating of 8.0. In fact, since Tiger burst onto the scene in 1997, the five lowest-rated final rounds have coincided with his three Masters absences and two worst finishes. Masters ratings are ultimately influenced by more than just who’s in the mix toward the end of the final round. But when you’re basking in the Masters theme song and Bob Ross-like whispers of CBS’s Jim Nantz this Sunday, rest assured that if he’s calling Tiger’s name on 18, CBS will be enjoying the type of ratings that only Woods (or Nicklaus) can create. CBS first televised the Masters in 1956, covering the final four holes. There are no Nielsen ratings available for that telecast. In 1957, CBS aired one hour of Sunday Masters coverage, earning a rating of 3.0. Given the limitations, I excluded those two years from this analysis. Excluding golfers who played or peaked before CBS began televising the Masters. The Masters has concluded on Monday six times since 1958. In 1961, 1973 and 1983, the final round was completed on Monday because of rain earlier in the tournament. In 1962, 1966 and 1970, players who were tied for the lead after the final round competed in an 18-hole playoff on Monday. The Masters switched to a sudden-death playoff in 1976. I elected to show Sunday ratings to maintain consistency of day, as Monday afternoon telecasts can be subject to ratings drop-offs. 270, equaled by Jordan Spieth in 2015. The 1966 Monday playoff between Jack Nicklaus, Tommy Jacobs and Gay Brewer earned a Nielsen rating of 12.0. Faldo’s two other wins drew above-average viewership. The final round of the 2004 Masters also started one hour early because of the possibility of inclement weather. 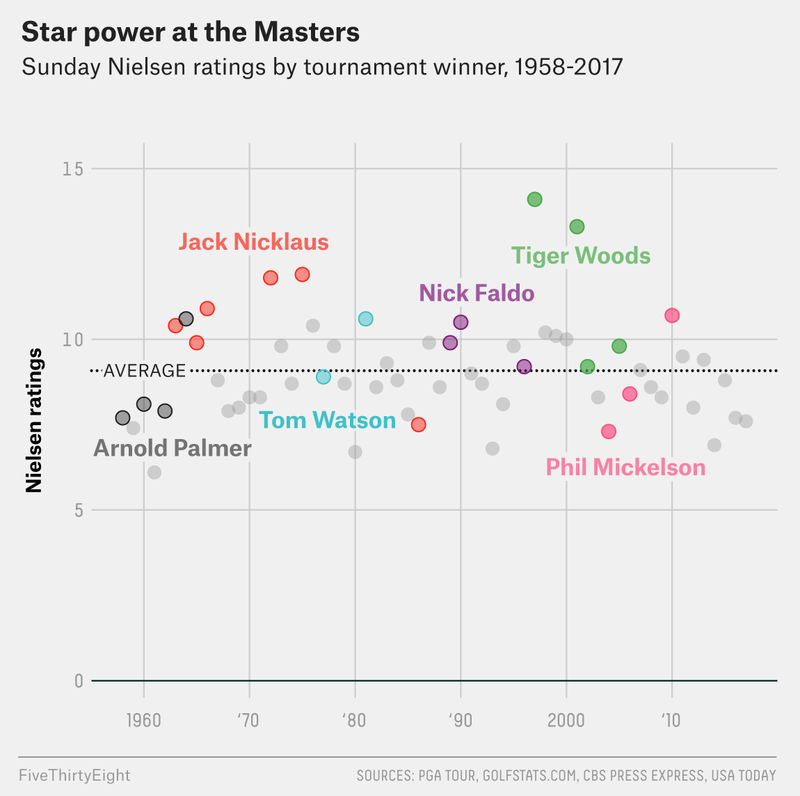 Mickelson’s second Masters victory in 2006 produced a below-average 8.4 rating despite Tiger finishing tied for third. Woods had won in 2005, and each time he’s pursued a repeat, ratings have declined from the year before.